With the aim of recovering, organizing and disseminating memories, experiences and knowledge from Valencian agro farming main characters; Artxiviu de l’Horta propose, with the support of Carpesa Council, this domestic archives creation workshop to learn how to use basic recording and editing tools. This workshop will be hosted by Miguel Ángel Baixauli, Daniel Tomàs Marquina and José Juan Martínez. During the workshop low cost techniques will be explored to gain the most from our homemade productions. 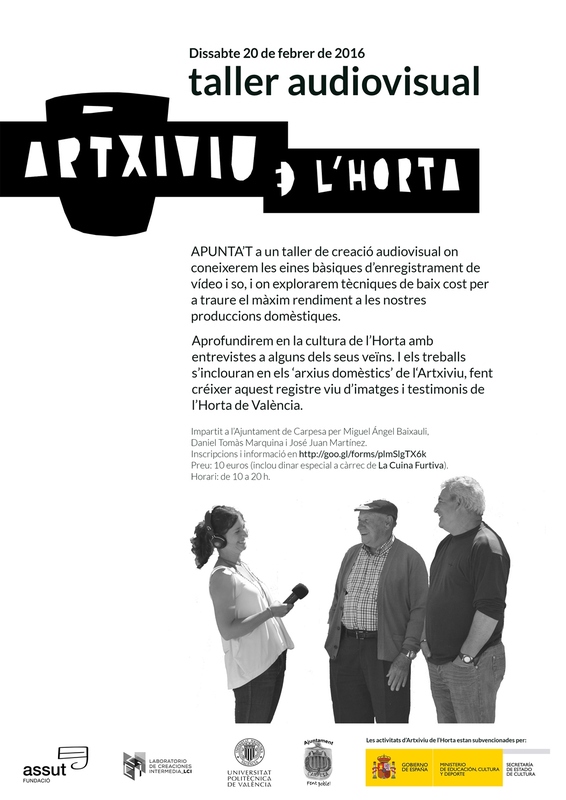 Interviews to neighbours will be taken to deepen in l’Horta culture. Workshop will take place Saturday February 20th 2016 from 10am to 8pm at Carpesa’s council headquarters. Price is 10€ including lunch offered by La Cuina Furtiva. Incriptions have to be submitted at: Taller Audiovisual d’Arxius Domèstics.